Laptop running WINAUE. Running Bomberman on the projector. 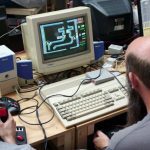 Following the success of the first SWAG meeting back in early May, which saw 12 Amiga fans get together for an afternoon of retro gaming, chat and general tinkering, it was decided that a second session should be arranged for the 17th of September. 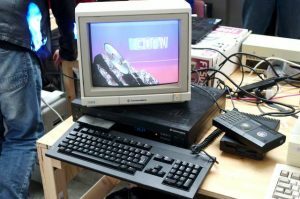 Our second meeting played host to a real selection of Amiga hardware meaning you weren’t short of something to sit down in front of and try out. The main feature for this month was “arcade conversions”. The Amiga plays host to some absolutely terrible conversions, but we were only interested in the cream of the crop. 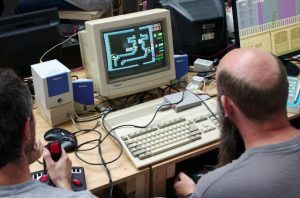 An Amiga 500 equipped with Gotek was loaded up with a stack of arcade games, and alongside that we had a PC running MAME so we could compare the versions side by side. Some of the titles we played included Toki, Pang, Midnight Resistance, Buggy Boy and Commando. 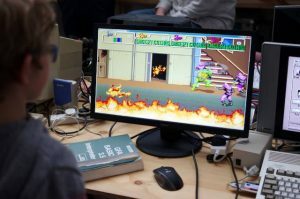 The general consensus that afternoon was that Amiga really does have some great conversions! 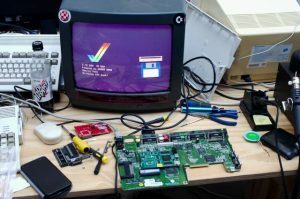 Steve Netting’s Vampire 600 – First boot! Elsewhere, and after a number of attempts to get Amibian up and running on a Raspberry Pi 3, and being unable to resolve issues with the screen resolution, we reverted to the trusty UAE for ARM installation for the remainder of the session. 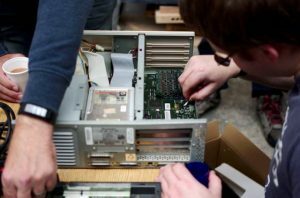 On another desk a dead Amiga 4000 was brought back to life. The leaking battery was removed and eroded tracks were cleaned. Prior to power-on a small crowd circled the machine ready to see what would happen. The excitement on people’s faces when the machine loaded to Workbench was a real joy to see. The A4000 required further work, but this would need to be carried out after the session. If you’ve read the kit list at the top of the report properly you’ll have noticed that we had one imposter machine in our midst in the form of a BBC Master 128. This wasn’t an ordinary BBC Master, as it had 2GB of storage, 2 x battery backup carts and 4 different operating systems. This was brought along as a number of members wanted to see this up and running. 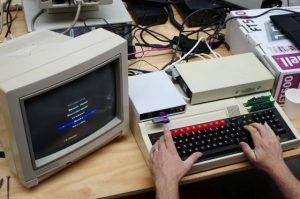 We’ll likely bring one or two other platforms along to future meets, with the deal being if you bring another non Amiga platform along you also have to bring an Amiga. Well, it IS an Amiga usergroup! On another bank of desks we were testing yet another Amiga set-up. 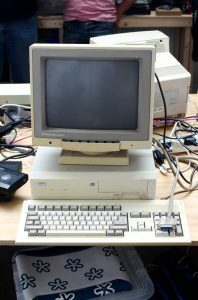 The group had been kindly donated a full Amiga 500 desktop suite, complete with monitor and software. 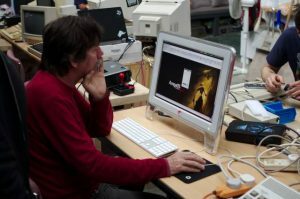 The hardware originally belonged to an Amigan who used his system for video editing. Unfortunately he’d recently passed away, and one of his children wanted it to go to someone who would use it. 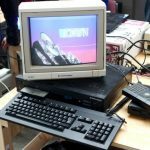 We found one Amiga user who was keen to get back into the hobby, and who had the knowledge to bring it back up to fully working order. This went off with him and it’ll be coming back at the next meeting repaired and ready for use. Towards the end of the session talk drifted to the next meeting. After some discussion we’ve decided that the next meeting will be held at the Swindon Makerspace on Saturday 14th January. We’ll be meeting in the greasy spoon next door to the venue from 11am, and getting things underway from 12 noon. The first two meetings ran until 4:00pm. Due to a number of requests from those travelling from further afield, the January meeting will be the first that runs until 5:00pm! Review by Robert Hazelby 30.11.16.